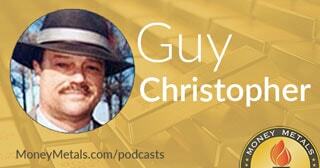 Coming up we’ll hear a wonderful interview with Guy Christopher, one of our most popular columnists at MoneyMetals.com. Guy enlightens us as only he can on a couple of well-known but very misunderstood stories – Robin Hood and The Wizard of Oz – and explains how both underwent changes and ultimately developed either a socialistic or an anti-sound money narrative. You will not want to miss a fascinating interview with Guy Christopher, coming up after this week’s market update. Precious metals markets got hit this week following the Federal Reserve’s latest policy musings. On Wednesday, the Fed announced a quarter point rate hike as expected. Policymakers also delivered a slightly more hawkish outlook for 2017, upping their projections from two rate increases to three. In response, traders bid up the dollar and sold just about everything else – stocks, bonds, and metals. Selling in the PM space accelerated on Thursday, with silver closing at its lowest level since June and gold revisiting levels last seen in early February. As of this Friday recording, gold registers a 2.5% loss for the week to bring spot prices to $1,132 an ounce. Silver prices come in at $16.12 per ounce down $0.85 or 5.0% on the week. Both gold and silver have now given back much – though not all – of their gains for the year. A sharp sell off since the November election puts the money metals in oversold territory. They ought to be due for a bounce soon. Whether that bounce represents a move off the final bottom in this correction remains to be seen. The longer term fundamentals continue to be constructive. Gold and silver both face a supply crunch as soon as next year as mining output declines. HSBC analysts now forecast that the silver supply deficit will grow to 132 million ounces in 2017. Next year could also see investors seeking inflation hedges. Even though the dollar is strengthening against foreign currencies and the Fed taking small steps toward tightening, inflationary pressures are gathering. This week’s producer price index report shows that wholesale inflation for November rose by 0.4%. Not a dramatic number in and of itself, but producer prices are now rising at their fastest rate on an annualized basis since 2014. If sustained, the recent uptick in the PPI could bring core inflation rates up to the Federal Reserve’s 2% target in early 2017. At her press conference on Wednesday, Fed chair Janet Yellen took pains to reassert the central bank’s “independence” from Congress and the White House. Yellen apparently felt the need to tell the world in Fedspeak that the Federal Reserve won’t help Donald Trump and Republicans implement their economic goals. For someone who has insisted up and down that she’s non-political, Yellen sounded an awful lot like a politician. She claimed it would be a mistake to roll back Dodd-Frank regulations. She suggested fiscal stimulus of the sort Trump wants is unnecessary. And she said Donald Trump as president would bring “considerable uncertainty” for policy makers. She vowed to continue serving as Fed chair at least until the end of her term in 2018. Yellen even suggested that if she isn’t reappointed, she might decide to stay on as a board member – something departing Fed chairs can but almost never do. Janet Yellen is trying to make it clear to Donald Trump that she will defend the institutional interests of the Federal Reserve against any efforts by him to shake things up. Right now the Federal Reserve Board has two of its seven seats vacant. Trump can move immediately to fill those seats with his appointments, pending Senate approval. Trump can make the Fed more politically tilted toward Republicans, perhaps even more free market in ideology. But don’t expect him to lead any kind of monetary revolution. His policy priorities of cutting tax rates and boosting spending on infrastructure and defense will likely grow the budget deficit. He’ll need the Fed to continue supporting the bond market and holding real interest rates down in order to avert a funding crisis. The political, economic, and monetary forces now in play provide no good reasons for investors to exit their precious metals positions. There are many good reasons to think that gold and silver will recover and gain over the next year and beyond. Of course, as Janet Yellen reminds us, markets face “considerable uncertainty” about what the Trump administration will bring. Precious metals are no exception. In uncertain times, the best investors can do is make sure they are prepared for whatever comes by being diversified across a broad spectrum of assets and asset classes. An allocation to physical precious metals of 10% to 25% of your portfolio will balance it out and make it more resilient to inflation, geopolitical turmoil, bank failures, and other looming threats that may not yet even be known. Well now without further delay, let’s get right to our exclusive interview. Mike Gleason: It is my privilege now to welcome Guy Christopher, one of the featured columnists on our MoneyMetals.com website. Guy is an investigative journalist and published author, but he's also a former stockbroker and veteran of the 101st Airborne serving in the Vietnam War. All of this real world experience combined with his communication skills has helped him provide our readers and customers with some really great insights. We have thousands reading and commenting on his writings each time we publish one of his pithy articles. Guy, welcome back, it's always great to talk to you and it's been a while. How are you? Guy Christopher: Well thank you Mike, it's a pleasure to be with you and an honor to be invited on your program. Mike Gleason: I'm excited to have you on today because it allows us to ask you about some of the great articles you've penned for us over these last few months. First off, in your piece titled The Colors of Money, you wrote about how Andrew Jackson, a strong advocate against central banking, is going to be replaced on the $20 bill here soon. Something he probably never wanted to be on to begin with based on his ideas about paper money, but it's a slap in the face nonetheless. As we start out here, give us a little bit of background and history on the man they called Old Hickory. Talk about his insistence on waging a fight against the idea of central banking, something he even called "subversive to liberty". Guy Christopher: Sure. Andrew Jackson, President, 1829-1836, was a foe of central banking. He believed in sound money. A lot of folks don't know that Andrew Jackson actually forced buyers and customers of the federal government to use gold and silver rather than paper money. He did that by executive order, and it caused a lot of concern among bankers because they had to come up with gold instead of paper. He was a foe of central banks for the same reason that people today are against central banks, he saw the dangers of printing money that was not backed by sound money, by gold and silver. And it was the subject matter of the early 1830s when he was President, and he finally got rid of what was known as the Second Central Bank of the U.S. He got rid of it in 1836 when its charter expired. It ran from 1816 to 1836, and Jackson was absolutely instrumental in getting rid of the central bank. And of course we went for 70 or 80 years, up until 1913, before the U.S. had another central bank. So his legacy there was several decades of central bank free commerce in the United States, and it was financially and economically, except for the five years of the Civil War, it was a pretty good economic system for the country. I think Andrew Jackson was probably correct in fighting the central banks, but he was certainly known as the Bank Buster back in his day. "Old Hickory's 1836 victory held steady until 1913, when the bankers gathered in secret at Jekyll Island, Georgia to plot the greatest bank robbery in history. The scheme was simple. First, print all the money they wanted backed only by government promises. Then, day by day, steal all the wealth it represented through built-in, unstoppable inflation. As more and more Federal Reserve debt coupons would litter the landscape their value would shrivel to less and less. Since government always has first use of cash hot off the presses, only unsuspecting taxpaying citizens would ever be financially harmed. It worked like a charm." Since the Fed was created, the dollar has lost about 98% in the 100 years since, Guy, and we've had nothing but a constant cycle of booms and busts. But it wasn't always that way, as you alluded to a moment ago. Please talk about the U.S. economy both before and after the Fed. Guy Christopher: I could illustrate it with one example, Mike. George Washington and Thomas Jefferson paid just about the same in cost for a good horse, for a good shotgun, for a tankard of ale at the inn, as Teddy Roosevelt paid in 1906. So 120 years, inflation was not a word that was in the American lexicon. Yes there was such a thing as inflation, but nobody talked about it because prices weren't going up. Prices were pretty steady for about 100 years or more, and the only real inflation problem that the country suffered was during the war between the states, 1861 to ‘65, when costs got out of hand for the U.S. government. Of course the Confederacy was destroyed and every paper dollar the Confederacy printed went to zero, except for the ones today that are so rare that they are actually collector's items, but from an everyday common man standpoint the Confederate money was worthless. Confederates minted, very few silver coins. I'm not aware of any gold coins ever circulated by the Confederacy, but still in all, for most of the 1800s, prices remained the same. Graphs show that, history shows that. And that was largely because gold and silver had backed any paper money that the government printed. And it worked for quite a long time until, of course 1913, when the Federal Reserve was created, in secret, by bankers, to protect their ability to print money. So the Federal Reserve and the Central Bank of the United States was really a new idea in 1913. Most people had no idea what meant. They thought, hey, the government's doing it, let's go along with it. Of course what we have today is constant, every day, moment by moment inflation. It's a myth that the government has never defaulted on its debts. I hear quite often that America has a perfect credit record and has never defaulted, but that's just not true. Starting with the Continental dollar, the first paper money, printed by the Continental Congress in the 1780s. The Continental dollar crashed, giving us the phrase, "not worth a Continental." Well that's where the phrase came from, because there were millions, literally millions, of Continental dollars out there, and the public wouldn't use them because the public found them worthless. The government defaulted on its gold obligations 1933, wiping out, gold bonds, gold obligations. The government defaulted again on gold in 1971, when Nixon, quote "closed the gold window," unquote. So the government has defaulted on its obligations several times in its history, and the greatest default has been ongoing, planned, deliberate inflation. And if folks don't understand inflation, it just boils down to, the more that money's printed, and the more money that floats around out there, the less it's worth. Usually sooner than later, but now it depends on the times and the politics, but that money suddenly becomes worth less than it was yesterday, and so you've got higher prices, which creep up by pennies a week, or pennies a day, and people really don't notice. But in that respect the United States government has defaulted on lots and lots and lots of obligations. So it's not unusual to think that the United States might one day again default on its obligations. Mike Gleason: Obviously with Fed policy we have a lot of booms and busts that are created, they just basically prop up different asset bubbles, we're seeing that in spades here today. And while we're on the topic of the Fed, we've just seen officials there once again hiking rates. They've painted themselves into a corner. It's easy to print money and lower rates, but it's also very hard to stop. Do you think they can pull themselves out of that jam that they're in and normalize interest rates, or might they stay the course at zero, or even go to negative rates at some point in the future until pensions collapse, or the bubbles that they've been blowing up in bonds, equities, and real estate finally pop, bringing about a crisis even bigger than 2008? What are your thoughts there, Guy? Guy Christopher: My thoughts are not optimistic. A quarter point is really meaningless. A quarter point doesn't mean a lot. You've had other guests on your program say the same thing, and I tend to agree with them. A quarter point is not such a big deal, but when you look at the big picture, the interest rate should tell you what your money is worth, what the savings you have is worth, what the money that the government is printing is worth. If interest rates were around 5% – historically that's where they've been for a long time – if you had interest rates that were normal, then that would mean that your money is pretty stable and that your money is worth anything. But when the government itself, and the Federal Reserve, and the Treasury, when they themselves tell you that the interest rate should be zero or even negative interest rates, known as NIRP, and that's something they're talking about, we've seen it overseas in Europe and we're hearing about more and more of that in the United States. When they tell you that interest rates are zero, they're telling you the dollar's worthless, that the dollar has no value, that the dollar is just a piece of paper with zero value, or with negative value. If you sit and look at that and say, "My government is telling me that the money that's floating around in circulation is worthless, why should we trust this money, why should we pay attention to what the government is saying about this money," we should be worried about that. Most people don't think about it because inflation was planned in the first place to be so minute, day by day, year by year, that we would not notice it. That is why I wrote it worked like a charm. We haven't noticed it. For the most part, Americans don't really understand inflation. They think that prices are supposed to go up, but that's just not the case in a healthy economy. Mike Gleason: Certainly it gets back to the idea of Keynesianism versus Austrian economics. You've got savers being punished with zero interest rates and a lot of speculators are out there trying to chase yield, and that's what money does. It tries to chase yield and builds up these asset bubbles, and the whole thing is just based on debt, and that's not really how it's supposed to work. Now moving on, I want to chat about your latest piece called Fiction, Fairy Tales, and Fiat. You highlight how, sadly, so few Americans these days have any clue about the sound money ideas that we're talking about right now, and why it's so important. And I'm especially talking about the millennials, or that age block in the 18 to 24 demographic. There almost seems to be a turn towards the ideals of government-run socialism as you discuss in this piece. You make the case that the very thought of taking from the rich and giving to the poor is ingrained in the younger generation from an early age thanks to the story of Robin Hood, but the original story is actually totally misunderstood by most. Talk about this. Guy Christopher: The story of Robin Hood started 600 years ago. It was folklore passed on by balladeers, passed on father to son, so to speak, and basically it was an anti-government storyline. It was a storyline that said the government is stealing everything we’ve got, and here is our champion, this fellow named Robin Hood, who is out there trying to take that wealth back from the government, and redistribute it, actually, to the people it was stolen from in the first place. Well that storyline wasn't very popular, especially after Franklin Roosevelt grabbed everybody's gold in 1933. That storyline has changed to what we have today, which is Robin Hood robbed from the rich to give to the poor. I just read a piece, I love the guy's writing, David Stockman, who was one of Reagan's budget guys. Stockman wrote a piece in which he referenced Robin Hood as a fellow who robbed the rich to give to the poor. It is an ingrained thought that that's what Robin Hood was doing, but the fact of the matter is, Robin Hood was hijacking the IRS on the roads of Sherwood Forest trying to get tax money back that had been stolen away from the common folk. Educators and government weren't really happy with that particular storyline of course, so it became one of robbing the rich to give to the poor, which is basically where we are today with socialism. Redistribution of wealth, taking it from those who earn it and those who work for it, and giving it to those who did not earn it or did not work for it, is a form government subsidies. We've known this could happen since 1805 when Alexis de Tocqueville wrote in Democracy In America that the American system would work just fine until the people discovered that they could vote themselves money from the common treasury. And I think that he was right. It has worked just fine until we've gotten around to this "share the wealth" attitude. And that's something I believe, by the way, that Andrew Jackson was well aware of. He and de Tocqueville lived in the same timeframe, and I'm sure that Andrew Jackson was aware of de Tocqueville's writings, and may very well have been influenced by them. So Robin Hood is well entrenched as a socialist, and when you tell these stories to children in grade school, and they get it stuck in their heads that, “Hey, it's okay to rob the rich to give to the poor”, then what do you expect when Bernie Sanders runs for president? You're going to have a heck of a following right behind him because they were taught from the age of four, or five, that socialism is a good thing, even though they may not have known what to call it. Mike Gleason: Now later on in that piece you write about another well-known story, that of The Wizard of Oz. It was actually author L. Frank Baum's commentary on the battle between the proponents of the gold standard and the silver standard, but yet key parts of the original story were adapted and changed for the major motion picture that was made shortly after FDR coincidentally confiscated gold from the American public. Give us some background on that, The Wizard of Oz. Guy Christopher: The entire episode was known as bimetallism. Silver interests wanted more silver in circulation, and that happened to coincide with the American public, which needed more silver in circulation. There was a legitimate argument against it in that more silver in circulation might have meant inflation, it might have meant higher prices, it might have meant a loss of control of the economy, and so it was a legitimate discussion. The author of The Wizard of Oz was on the “silverites'” side, they were called “silverites”, and he felt that the common man was getting gipped because they didn't have enough silver in circulation. When he wrote his classic, The Wonderful Wizard of Oz, it was in effect about the fight between the gold and the sliver interests. The silver interests actually wanted both a gold and a silver standard. The opposition wanted to just leave the standard at gold. The story has a young woman being torn from her home by the forces of nature, she's thrust onto this adventure where she meets wonderful people, and she meets a lot of bad actors along the way, the same type of experiences all of us have during life. And the big change in that story was that she was wearing silver slippers, and that she did not understand, in her journey, that the power of silver in her slippers was all she needed to find her way home. And finding her way home was really the only thing she wanted in the first place, was to get back to where she was when the tornado ripped her out of her Kansas house. She doesn't understand that. She learns it later, but silver was dropped from the script. The silver became rubies, there's no mention of the yellow brick road being a road of gold. And the reason for dropping silver, of course, was to get silver and gold off the mind of the American public. This movie was made In 1939, just a few years after FDR made his 1933 gold grab. There was no appetite whatsoever for bringing up again the argument that sound money is better than paper money. Nobody wanted to hear that. Hollywood played along with government, and so we ended up with The Wizard of Oz, Dorothy in ruby slippers, no mention of silver, and a movie that everybody loved, I think primarily because of the graphics. The travels that the girl made during her adventure were well animated, and I think that had a lot to do with that picture's success. It certainly didn't have anything to do with the honesty that Baum had tried to put into the parable that he wrote about bimetallism. Mike Gleason: I've heard other comparisons there, other analysis on that, about how I think the Wicked Witch of the East represented the evil bankers, and of course yeah, obviously the yellow brick road represented the gold standard and so forth. Fascinating stuff, revisionist history is always very interesting. We do have this move towards socialism and globalism, and obviously it's very concerning, but there is some reason for hope. Brexit and the growing discontent elsewhere in Europe seems to be signaling that many people have had enough of the march toward collectivism and globalism, we'll see if this current unrest is temporary or if it represents the beginning of the end of the EU. Do you see any of the current anti-globalist sentiment that is driving support for outsiders like Donald Trump here in the U.S. having any lasting impact? Guy Christopher: Oh I think it's going to have a great impact. We're seeing it all over the world, we are seeing it big time here in this country. I read an article a few days ago that Donald Trump has broken all records for small donor donations. I think that a lot of folks who had given up on politics over the past 10, 20, 30, 40 years are waking up and saying, "I think I'll take a chance on this guy." Why? Do they love the fellow? Not necessarily, but he represents something that they think they've lost. I believe his support is looking at him as a fellow who might restore some of the things that have been lost to this country. I don't think they're necessarily in love with Trump, I think they are in love with a lot of the things he has to say. Those things have been repeated around the world. Brexit was a wake-up call for that. Many other countries are talking about breaking away from centralized authority. Germany, heck Andrea Merkel has just lost two major votes in Germany. The last was Sunday, just a few days ago. She has now turned around and said, "Well maybe I will rethink bringing in 1 million refugees to Germany." That is a big signal that nationalism is playing a big role right now, rather than the global outlook. And I think that has come to this country, and I think Trump hit a nerve that no one really wanted to talk about. Had Trump not been in this race, immigration would not be on the discussion agenda, I believe. A lot of other things wouldn't be on the agenda. But I think that Trump has hit a nerve that is actually a worldwide nerve. Around the globe, Italy, France, Poland, Switzerland, Sweden, they are all saying, "We are losing our identities. We don't like that. We want our identities back." And they are all, in some form or fashion, following the things that Brexit, and now Trump, are heralding. Mike Gleason: Couldn't agree more. Very well put, great stuff as always. Thanks for your excellent insights once again. We always enjoy your writings and I look forward to reading more, as well as having you on from time to time to discuss those articles with our audience here. Keep up the good work. Take care and we'll talk to you again very soon. Hope you have a very good weekend, my friend. Guy Christopher: Mike, thank you. I've always congratulated Money Metals Exchange for the educational efforts. I would repeat that again today. I think you guys do a great job trying to educate folks as to just what finance, money, economics, sound money, are all about. Mike Gleason: Well thanks a lot. You're certainly a big part of that, and we're glad to have you a part of our team. Well that will do it for this week. Thanks again to Guy Christopher, MoneyMetals.com columnist. To check out any of his fabulous work, just go to MoneyMetals.com and type in “Guy Christopher” into the search bar for links to all of his great articles. And check back here next Friday for the next Weekly Market Wrap Podcast. Until then, this has been Mike Gleason with Money Metals Exchange. Thanks for listening, and have a great weekend, everybody.